It's time to cut the cable and leave your high-priced Internet provider behind. With Fixed High-Speed Wireless Internet from PA.net you can enjoy the freedom of being in control and have the ability to upgrade or downgrade plans at anytime. Enjoy the Internet without ever having to worry about how much data you use. Our affordable Fixed Wireless Internet provides you with unlimited service and no data caps. So you'll never have to worry about overage fees, or reduced speeds after reaching a monthly threshold. You'll get High Speed Internet all the time. From your credit card bill to that text message you just sent, hidden fees are lurking everywhere. Those costs can add up fast. We keep it a priority to be upfront and honest about what your Internet service is going to cost. You can select from a one year contract or pay month to month. We also offer customized business plans to meet your Internet needs. Fixed Wireless Internet provides High-Speed Internet access to a single location through radio waves. This eliminates the need for phone, or cable lines. Fixed Wireless Internet is a Line of sight service. A Technician will visit your location to perform a site survey and verify availability. 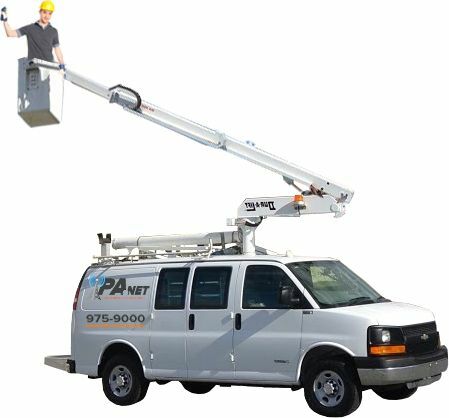 Our technician will ensure that you're within range and that you have a clear line of sight that is not obstructed by trees, buildings, or hills. If service is available at your location. A follow up appointment will be scheduled to install your Fixed Wireless Internet Service. A radio antenna (dish) will need to be installed to the outside of your home or office. Our technician will select a dish antenna that will work best for your location. The dish is generally smaller in size than a typical satellite tv dish. Mounting options vary by building type and location. The technician will inform you of the best location for the dish to be mounted, and what type of mount will be needed. A Ethernet cable will be run from the Radio antenna outside to the an entry point into your home. The illustration above is an example of how an installation may look inside your home or business. Each installation varies depending on your situation. The technician performing your site survey can help explain how your ideal setup may look like. Find out if Fixed Wireless Internet service is available at your location! You may qualify for our Fixed Wireless Internet service! Please provide us with your contact information so we can set up a time for your Free Fixed Wireless Survey. This will allow us to confirm service at your address. If you can't find an answer to your question, Please Contact US. We'll be happy to answer any questions you may have. A small antenna with an attached radio receiver/transmitter is installed on your home or business. This antenna is pointed at one of our nearby Internet Towers. When you send and receive information over the Internet, it goes over the secure wireless link from the radio/antenna to our tower. From there that information travels to our fiber-optic connection. From there the information travels out onto the Internet. Please see the Wireless Internet Coverage Area map. Or Contact us for full coverage information and to schedule a site survey for your home or business. Is Fixed Wireless Internet reliable? A site survey helps us determine if the signal that comes from our towers can be received at your home, or business location with a good signal strength level. Scheduling a site survey with us does not obligate you to purchase our services. It helps us determine if you have the necessary “line of sight” to get the fastest service possible. We can typically have your service installed within 2 weeks of placing an order and having a signed contract. How long does it take for equipment to be installed? The average installation for Fixed Wireless Internet can take between 2-4 hours. This includes: mounting and pointing the dish antenna outside your home or business, running the ethernet cable, installing your inside equipment, and then testing the signal to ensure everything is working properly. Is there equipment mounted on the outside of my home? For Fixed Wireless Internet to send and receive secure wireless signals, we will need to mount a radio antenna (dish) to the exterior of your home or business. These dishes are smaller than a satellite tv dish and can be mounted in a variety of different places. A ethernet cable will run from the dish along the exterior of your building to a location where it can enter free of interior obstructions. Any holes that are made are properly sealed to ensure weather and insects cannot enter. Does the weather affect Fixed Wireless Internet signal? Our installers do a site survey before installing your equipment to ensure that there is a good signal. Weather will not typically cause a degradation of service, even in very severe storms. Your connection should remain stable even during winter months or other stormy periods. Are Fixed Wireless connections secure? The technologies we have chosen to use in our network rely on industry standard encryption protocols and are highly secure. In addition, software encryption is employed on all data transfers. Also, typical WiFi and consumer grade wireless Internet equipment is not capable of intercepting or receiving our signals. We provide two different options to best suite your needs. Option One: You pay month to month. However, there is a $120 installation fee. Option Two: With a one year commitment/contract. Your installation fee is waived. Yes, you can change your plan at any time free of charge. If I choose a one year contact. What does it cost to cancel early?